What are you doing, and how and why did you start this journey? I’m Simon Crowther, the founder and Managing Director of Flood Protection Solutions Ltd. The flooding of my parents’ house kick-started my interest in engineering and flood defence. The flooding of my parents’ house in 2007 kick-started my interest in engineering and flood defence. We were out of the house for nearly a year whilst it was repaired, and there was an insurance claim in excess of £100,000. We never wanted to go through the upheaval, expense and stress of flooding again. Being flooded is traumatic. After the flood we scoured the market looking for flood defences, we bought a Canadian product called the Water-Gate barrier . In 2012, my family and I used the Water-Gate in a real flood, and it completely saved our house. I realised the barrier was available in 25 countries around the World, but not in the UK. I wanted to make a difference and improve our flood response by bringing the Water-Gate to the UK. Following a meeting in Paris, I secured the sole UK distributor rights and Flood Protection Solutions Ltd was born. I was just 18 years old. Despite reservations from others I remained undeterred. Once I had launched the business and secured the sole UK distributor rights, I set up a holding page for a website and wrote to homeowners in the nearby area informing them of the exciting news and letting them know they could now purchase Water-Gate barriers. These initial sales allowed me to invest in a full website and start to actively market the company. In business, there are obstacles every single day. Initially I found my age an obstacle, but I now believe it was a blessing in disguise. It made me work harder to get to where I am today. I’m passionate about reducing the flood risk across the UK. Whilst a large sale can be nice, the best bits are when we find out about a project that wouldn’t have worked without us, or when we have saved a home or community from flooding. One of my favourite moments was finding out one of our Water-Gate barriers had stopped a community of 12 homes from flooding in a village in Devon. Running a small business means you must be an expert in every area. Not only do I need to be an expert on flooding, but also things like finances, social media, marketing, recruitment, managing staff, and so on. What’s the worst thing that’s happened to you on this journey? Brexit. Without a doubt, Brexit has been one of the worst things to happen to us. The drop in the exchange rate effectively cost us tens of thousands of pounds. Its hard to overcome as it is an external factor, but we have had to just keep going and remain positive. On tough days this quote really helps to motivate me: “When everything seems to be going against you, remember that the airplane takes off against the wind, not with it.” – Henry Ford. What is your advice to anyone starting on a similar path? I truly believe that you should follow your passion. It is popular to try and make a ‘quick buck’, but ultimately if you’re passionate about something, you are likely to become very knowledgeable and well respected in the field. The money will follow, and you’re more likely to enjoy your work. The flood protection sector is incredibly difficult. It’s plagued with ‘feast and famine’ type funding. So far this year, four companies working in the sector have already gone out of business. 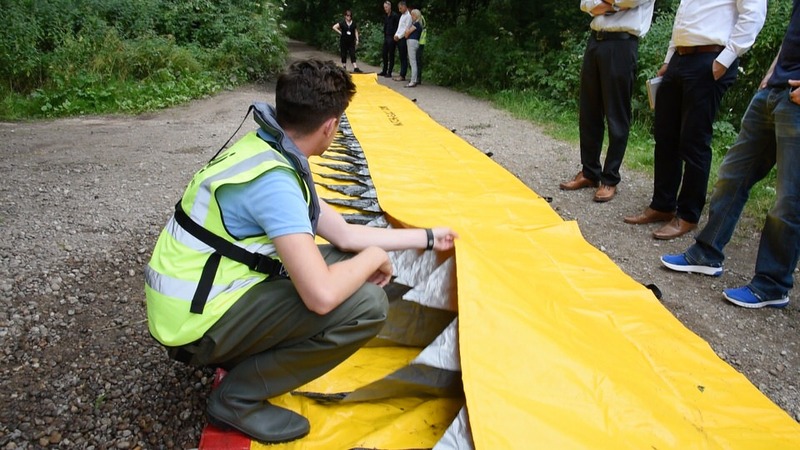 I’m working hard to make sure Flood Protection Solutions has a secure future and we continue to be able to offer great products and advice to reduce flood risk across the UK. Don't let the summer fry your brain!